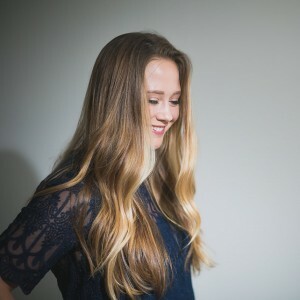 While my family doesn’t have any true Easter traditions, we always try to go out for an indulgent breakfast or brunch. I’m a sucker for a grand buffet at a nice hotel, and many years we’ve been out of town and able to enjoy some wonderful Easter brunches. Two of the most memorable were at the Ritz Carlton Amelia Island and the Breakers in Palm Beach. And the Dahlia Lounge in Seattle, while not a hotel buffet, is up there as one of the best breakfasts I’ve ever had. This year I’ll be staying in Cincinnati for Easter and I’ve made reservations for the Easter buffet at Orchids at Palm Court at the Hilton Netherland Plaza. It’s one of my favorite spots in the city and I’ve heard the Easter brunch is spectacular. I always tend to head towards the desserts and baked goods first and this year I’m especially looking forward to the biscuits and scones. Scones are popular in the U.K., especially in Scotland and England. The English mostly eat scones at tea time but the Scots tend to eat them all day long, with coffee for breakfast, with soup at lunch, as a mid-afternoon snack, and even at cocktail hour. In Scotland, you can find scones made from traditional white flour but bakers have become creative and started using oatmeal, cornmeal, and whole wheat flour. A milk product such as buttermilk or cream are traditionally used, along with fresh or dried fruit. The best scones are moist and tender, without being completely crumbly, and are slightly denser than a biscuit, but never tough. Scones should be able to hold their own and don’t need to be drizzled in icing or filled with supersweet flavorings, but traditionally are served with jam, butter, and clotted cream. 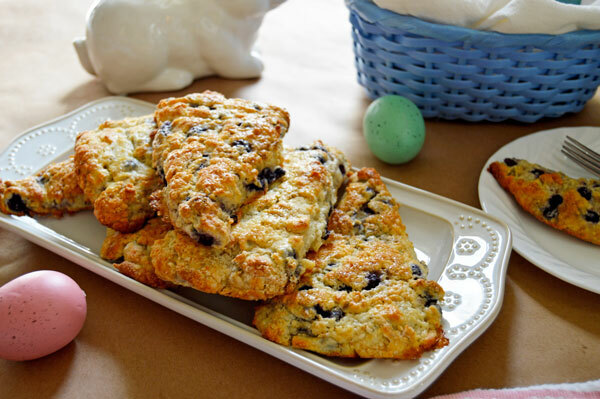 If you’re cooking at home this year, dress up your Easter breakfast or brunch with homemade blueberry lemon buttermilk scones. 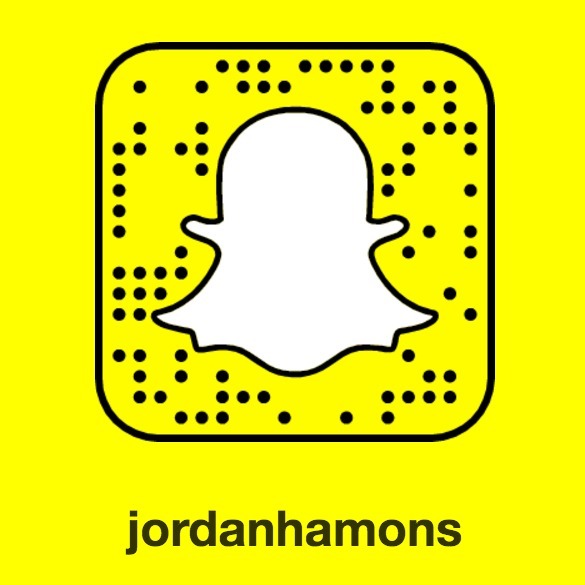 First, set up your area. 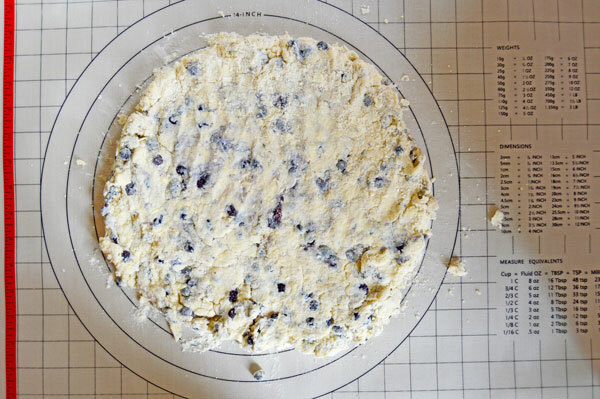 You will need a clean counter top or space to roll out the dough. Next, get your ingredients ready (the process we refer to as mise en place). Measure/weigh out the dry ingredients, wash the blueberries, zest the lemon, dice the butter, and measure out the buttermilk. Line a baking sheet with parchment paper. Make sure your ingredients are the right temperature. This will impact the mixing of the dough (if your butter is too soft you will have problems) and the rise of the scones in the oven. Both the butter and the buttermilk should be cold. Tip: Cold ingredients matter in this recipe so don’t let them sit in the counter for 20 minutes before adding them into the bowl. Measure out the buttermilk and put it back in the refrigerator until you need it. Measure the butter and cut it into small pieces, also keeping it in the refrigerator until you are ready to mix it into the flour. To start the scones, whisk together the flour, sugar, baking powder, and salt until smooth and evenly combined. Next, add the diced butter to the bowl and lightly toss it to coat with flour. Now, using your hands, work the butter into the flour until the mixture resembles a coarse cornmeal. The butter pieces will be all different sizes and that’s a good thing. Just make sure there are no pieces larger than a small pea. Tip: Many recipes suggest using two forks or a pastry blender to cut the butter into the flour. After much practice, I’ve found that using your hands is the easiest method and produces the best results. 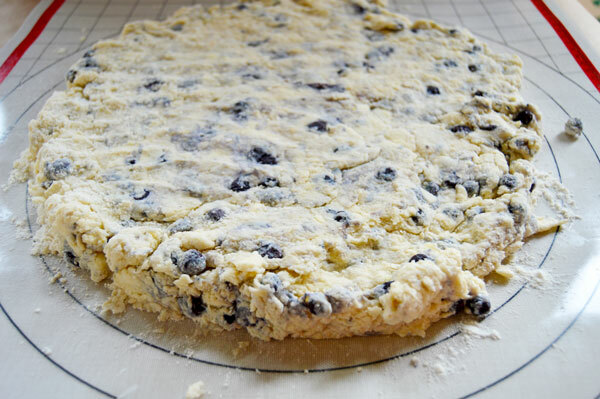 Once the butter is thoroughly combined into the flour, gently stir in the blueberries and buttermilk. 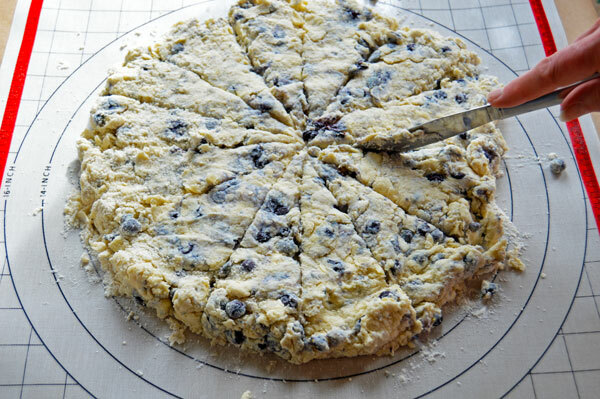 You want to use a gentle folding motion here and try to mix the dough as little as possible. Continue folding until the berries and buttermilk are evenly distributed. A few dry patches may remain but we will take care of those in the next step. Turn the dough out onto a lightly floured surface. 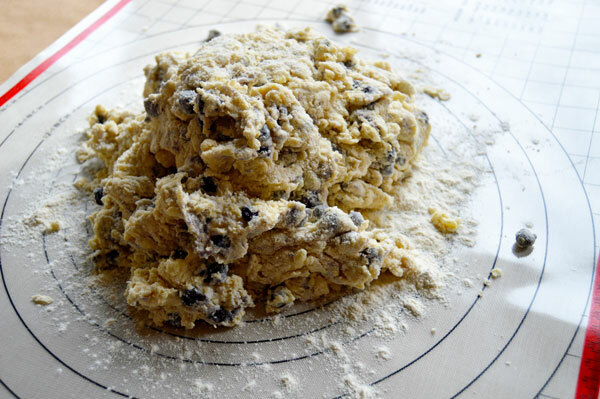 Flour your hands and lightly pat the dough into a 12-inch diameter circle with a thickness of about 1-inch. You don’t want to work the dough too much so it’s okay if the circle isn’t perfectly even. Cut the dough into 12 wedges. They don’t have to be perfectly even, and in fact, if you look closely at the photo below, you will see I accidentally cut 13 wedges instead of 12. Tip: If you find your knife sticking, lightly dust it with flour between cuts. Gently move each scone to a parchment lined baking sheet. Be sure to leave plenty of space between each scone or they will steam in the oven and not puff and rise like we want. Refrigerate the trays of scones for 30 minutes to thoroughly chill them. 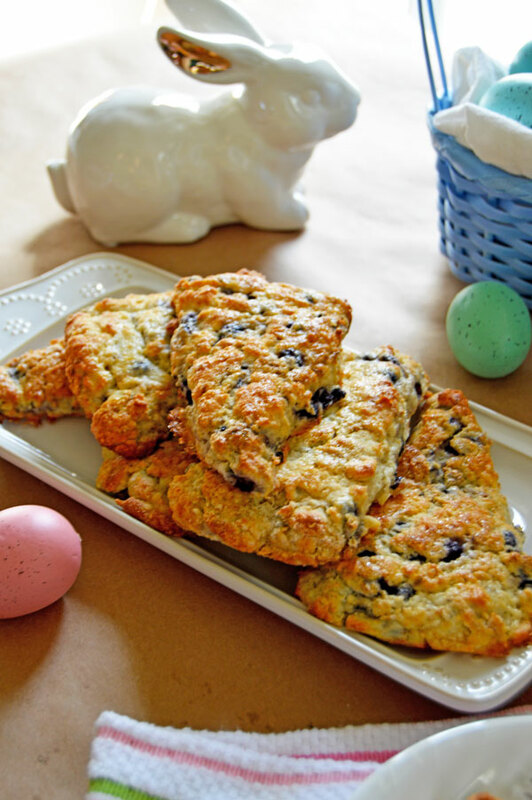 After they are chilled, lightly brush each scone with heavy cream and give them a generous sprinkle of sugar. Bake the scones until they are firm to the touch, puffed, and deep golden brown. This took about 22 minutes in my oven but I would start checking them after the 15 minute mark. Don’t take them out too early – the golden brown crust is what gives them the deep flavor and crunchy crust we want. Preheat oven to 375 degrees F. Line two baking sheet with parchment paper. 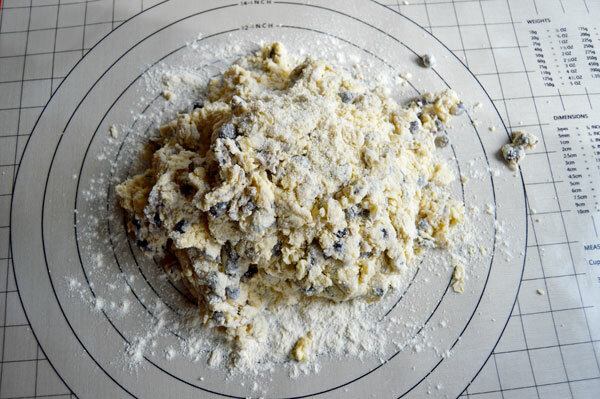 In a small bowl, toss the blueberries with 1/4 cup of the flour. This prevents the berries from sticking together and absorbs any juices. In a large bowl, sift together the remaining flour, baking powder, lemon zest, salt, and sugar. Add the diced butter to the bowl and lightly toss to coat the butter in the dry ingredients. Using your hands, work the butter into the flour until the mixture resembles a coarse cornmeal. The butter pieces will be different sizes (some sandy, some flaky) but make sure there are no pieces larger than small peas. 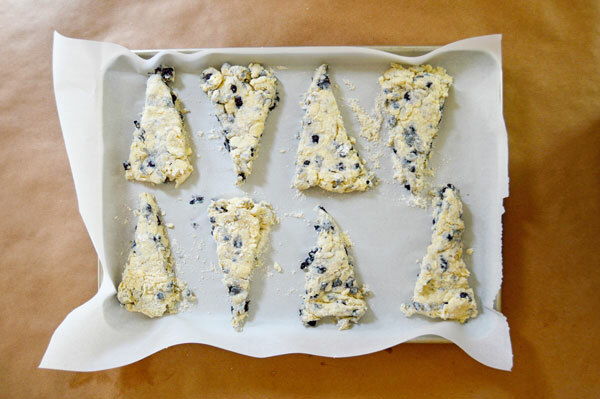 Using a gentle folding motion, stir the buttermilk and blueberries into the dry ingredients and mix until just combined. There should only be minimal dry spots remaining. Turn the dough out onto a lightly floured surface and using floured hands gently pat the dough into an even 12-inch circle about 1-inch thick. Cut into 12 wedges and place each wedge on the parchment lined baking sheets. 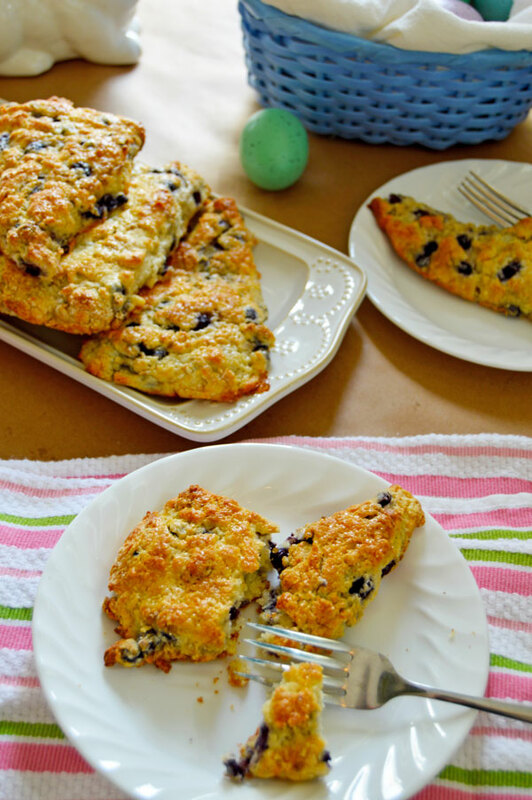 Be sure to leave plenty of space between each scone or they will not rise and puff. Place the baking sheets in the refrigerator for 30 minutes to thoroughly chill the dough. Once the dough is chilled, lightly brush the top of each wedge with heavy cream and sprinkle with a pinch of crunchy sugar. Bake until firm to the touch, puffed, and deep golden brown, approximately 18-22 minutes. These are best served warm from the oven but can be kept in an airtight container for 1-2 days. 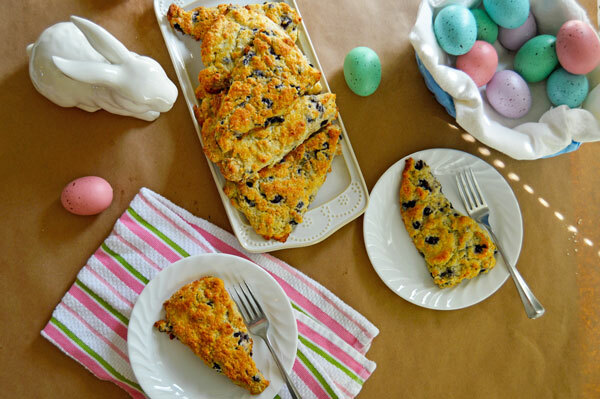 You can use frozen blueberries in this recipe but be sure they are thoroughly thawed and dried.